Best and most comfortable shoes I’ve ever purchased. I wore them with my suite to a job interview. I got compliment from the whole 5 panel interview team, the Lyft drive and many I passed on my way. I also got the job. I get so many compliments on these shoes. I was initially unsure about whether they’d work in an office setting and am so glad I bought them. I shop Cole Haan for my husband all the time. Love there brand of shoes! OG. Looks great. Feels good. Tons of compliments. I got these for Christmas and received so many compliments on them. They are comfortable and look great! I am a big Cole Haan shoe customer. The Original Grand Wingtip Oxfords are light as a feather, yet hold your feet with the right amount of firmness. Great with a suit or in jeans! An amazing, comfortable for business casual excellence. I would reccomens this particular pair of shoes because they are stylish, comfortable, and lightweight. I’ve received numerous compliments on them. Absolutely love these. They are super comfortable. Look great with dress pants and jeans. These shoes are awesome. I definitely recommend them. I bought these for my husband, he loves them. He says they feel like you are walking on clouds. They are really light and a perfect shoe for being on your feet all day. I've referred you to two other buyers last week. I always get compliments on these shoes. I love these shoes. Have been wearing the for years. Have several different colors. Bought these for my hubby. He loves them not only are they stylish and comfortable they come in a wide. He has the hardest time finding stylish shoes in a wide width. Purchase these shoes and i must say, my feet is happy and the shoe is very stylish! Love it! I will definitely be buying Cole Haan in the future. I highly recommend this shoe. Comfortable right out of the box. I received a lot of compliments. Single most comfortable pair of shoes I’ve ever owned. I keep looking for other styles in size 14. I’ve gotten compliments on them walking through an airport. Have a brown pair and love them. Love the contrast black leather and white sole! I already own a similar pair in brown, the one with the red laces, they are comfortable and stylish at the same time. Easy to dress up or down for various occasions. 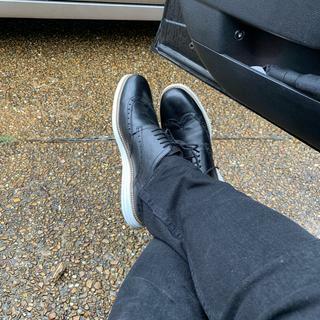 I like the style and comfort of Cole Haan shoes. Looking for a miracle shoe. My husband tried these on in the store. Lots of support, looked great and light weight. I have two pair and they are very comfortable. My second pair. I've never had a shoe that got more compliments by all ages. Happy to see there's a wide size as well. This style has a nice clean look. Also, I own the brown pair, and I receive many compliments when wearing them. It has a classic look with a tennis shoe feel. i was looking for a stylish and comfortable dress shoe. Comfort and business casual style, also a high quality product with longevity. I love this shoe..This is my third pair. They are really comfortable. the shoe runs a little big so drop down a size. Whats the difference between these and Men's GrandEvølution Wingtip Oxford? BEST ANSWER: Both styles are crafted with fine leather uppers in the traditional wing-tip design and both styles offer our exclusive Grand OS footbed technology. The difference is in the sole design. The OriginalGrand sits on our exclusive sole which provides great comfort and lightweight flexibility. The GrandEvolution is a newer member of the Grand family, a sportier version, having a sole that is designed with shock absorption and stability in mind. For more details, please view the description on the product pages. I've had 2 foot surgeries and want the more "cushier" option. So would that be the Original Grand, Zero Grand or Grand Evolution? Thanks! Is the rubber sole replaceable after they have worn down? BEST ANSWER: The Original Grand Collection uses our exclusive molded, ridged sole design that incorporates Grand OS Technology which provides lightweight flexibility and comfort. If you were to bring this shoe to be re-soled, a shoe repair shop might be able to use another form of synthetic sole, but it would negate the properties of Grand OS comfort. Does this come in a B width? BEST ANSWER: This Men's style is available in Medium (D) or Wide (E) widths only. How can I obtain a replacement removable insole for the Men's ØriginalGrand Wingtip Oxford? BEST ANSWER: In most of our footwear, the insole is not designed to be removable and is usually permanently secured to the foot bed of the shoe. Sorry - our footwear is not designed to accommodate orthotics. We do not manufacture or sell replacement insoles. When I purchased these, the salesman advertised these as being removable and the listing on Amazon has other purchasers who confirm this. Mine has deteriorated. I just want the same insoles to replace in the shoe. what length replacement shoe lace should i buy for this? BEST ANSWER: Lace lengths depend on number of eyelets, shoe size and style. Generally speaking, a men's 5-eyelet oxford would use 40-45" laces, depending upon the size of the shoe. If you would please call our online Customer Service team at 800-695-8945 and provide this information, they will be happy to help. You can also measure the original lace that came with the shoe. BEST ANSWER: Yes, visit the link "Global Shipping" to learn more about International Checkout. Our customer service team is also available for assistance. They can be reached at: 800-695-8945. When will Men’s size 15 Original Grand wingtip Oxford in black and white be back in stock online?